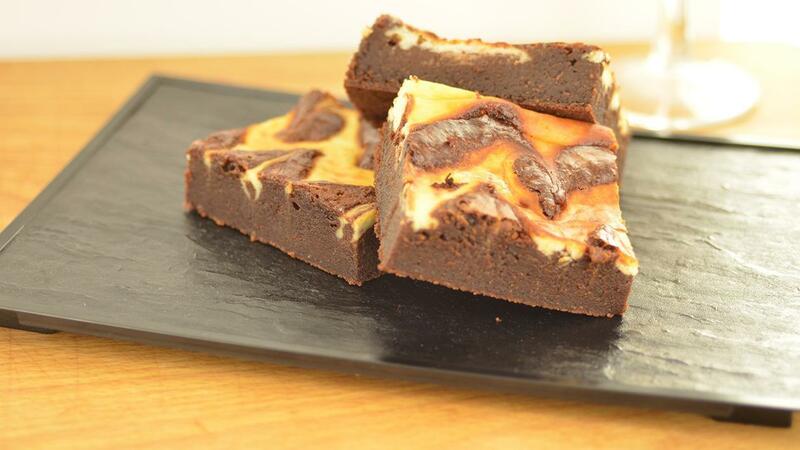 Try this indulgent chocolate brownie recipe made with a rich swirl of vanilla cheesecake on top. You guests will love this classic dessert recipe. Use FLORA Buttery for the sunny taste with lower saturated fat or try vanilla ice cream for the perfect finish. Preheat an oven to 165ºC. Line a Gastronom tray with greaseproof paper. Beat together all the cream cheese ingredients to form a smooth paste. Melt together the chocolate and the butter in a bain marie, then remove from the heat. Add the sugar and beat in till incorporated. Beat in the eggs one at a time until the mixture becomes glossy. Lastly fold in the flour. Divide both the mixes into separate piping bags. Alternate with both mixtures to create a marbled effect. This can be swirled to create a unique pattern. Place into the oven and bake for 30-40 min. until both mixes are cooked. Melt together the chocolate and the FLORA Buttery in a bain marie and remove from the heat. Your opinion matters to us. Please take a minute or two to complete our survey and let us know what content you find useful and what you would like to see more of in the future. UFS wants to inspire you with delicious recipes and food trends and offer practical tips and advice for your professional kitchen.